Bay windows are actually three windows joined together to form a larger unit. Usually set at angles that protrude from the house (30 and 45 degree angles are the most common, though there are bay windows available with 60 and 90 degree angles as well), these popular windows provides your home with added light, better views of the outdoors, and adds style and volume to any space. 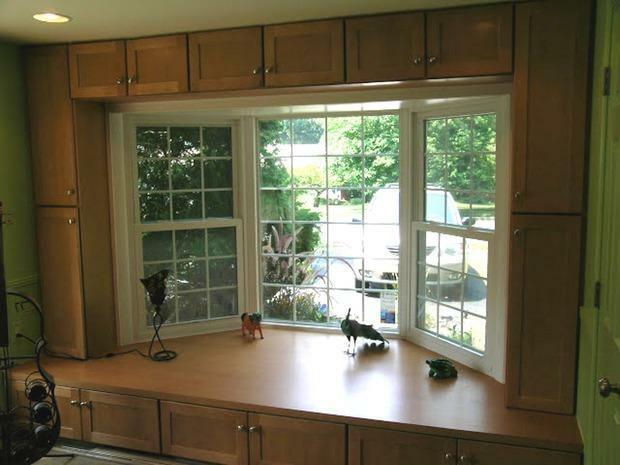 If you're thinking about installing or replacing a window in your home, a bay window is an excellent choice. Bay windows provide a splash of elegance to any room, and they do a lot to add a little extra dimension to the exterior of your home. Beyond their aesthetic value, however, there are a lot of pluses to these windows that go beyond just their impressive looks, including a more spacious feel to interior rooms and the actual addition of space. This can be particularly valuable if you live in a small house or crowded environment, and it's one of the main reasons these windows have become a mainstay in urban residential construction. Beyond creating a more spacious feel, they can also be transformed into relaxing places to sit, read the paper, drink a cup of coffee, or just gaze outside at the goings on in your neighborhood. And if you're the type who can't sit still and needs to get their hands dirty year-round, consider a 90 degree box window with a glass roof (also known as a garden bay), in which you can cultivate a small herb garden or other horticultural wonders. The other big benefit of a bay window is the added light it lets in from the outside and the better views you'll get from the inside. Their angled construction lets in light from multiple angles, making them much more efficient through the changing seasons than a traditional flat window. In addition, there's a lot more to look at from the inside. When it comes to views, these windows are hard to beat, whether you've got an impressive landscape to look out over or just enjoy keeping track of the neighborhood. Once you've decided a bay window is the right window for your space and needs, you'll want to carefully consider the different options before you purchase. For starters, think about size. Generally the bigger window you chose, the greater the benefits will be. It will cost more up front and to have installed, but it's usually worth the extra money to modify existing widow openings for a larger window. Once you decide how large of a window you want to install, you'll want to consider materials. Materials. Bay windows come in wood, vinyl and clad varieties. Wood windows need more maintenance over time to keep them in good shape. Vinyl windows are virtually maintenance free, but many people don't like the look of vinyl, especially in their living rooms and kitchens. Clad windows are the best of both worlds and priced accordingly. They are a vinyl window with a wood clad interior frame, but are more expensive than the other options. Finally, think about paying a little extra for triple-paned windows, especially in colder areas, as they are up to 25% more energy efficient than other windows. Consider spending extra for argon-filled or low-e glazed windows that admit solar heat in the winter and reflect it in the summer time for additional energy efficiency. In addition to window materials, you'll want to think about bay window treatments as well. A good set of bay window treatments can transform your new window from an attractive addition to a truly elegant space. The other reason bay window treatments are so important is that the extra light from one of these windows can really heat up a house during the hot summer months. Consider purchasing some quality bay window curtains to help block out the sun during the hottest hours of the day. A good interior designer that specializes in bay window treatments can help you decide which bay window curtains are going to be the best choice for both beautifying and increasing the energy efficiency of your home. Bay windows require the installation of braces or cables to properly support them, and if they are not installed beneath an eave, also require exterior roof installed. Because these special measures must be taken, it's best to hire an experienced contractor to install this valuable addition to your home. You want to be sure that your new addition is something you'll be able to enjoy far into the future, and hiring an experienced contractor to put it in for you is the best way to get that peace of mind.